• OxGord a leader in high quality pet supply and innovative pet care solutions is proud to offer you our Pet Potty Trainer Pad. 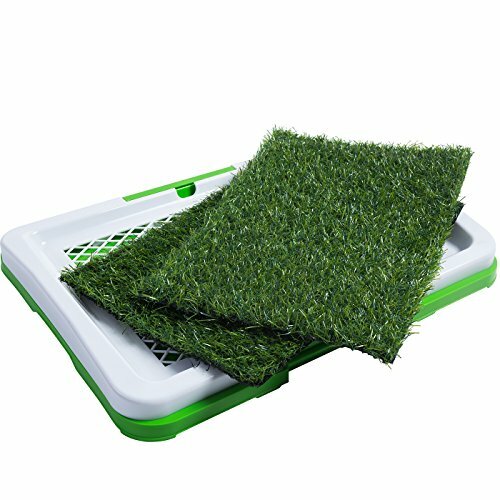 This organically scented turf ped pad is perfect for anyone looking to easily housebreak their dog or puppy without the need for urine soaked puppy pads or filthy, odor infested newspaper piles. Featuring an organically scented antimicrobial artificial grass pad which promotes your dog’s natural instincts to urinate. Our pad also features an innovative 3 layer system to capture and contain waste and odors. A top layer of organically scented turf rests on a second waste filtration and drainage grate helping to sift and separate liquid and solid waste. In turn waste drains into a locking easy to remove 100% leak free base which features an easy disposal tray for quick clean ups. • Potty pad is perfect for both indoor and outdoor use on you patio or porch and is the ideal first step in hassle free housebreaking of your dog or puppy. Great for anyone living in an apartment or urban setting or for puppies who spend a great deal of time home alone. • Customer Satisfaction Guaranteed. At OxGord we stand behind our Potty Trainer Pad with a no questions asked 100% Customer Satisfaction Guarantee. If for any reason you are not pleased with your purchase feel free to return it for a no full and prompt refund. Your satisfaction is our #1 priority, if at any time you have questions or concerns about our wide range of pet products feel free to contact us and we would be happy to assist you.